It would have been difficult to say who had most enjoyed the little feast and the rousingly told tale of their adventures so far, but Llythne would have put her money on the Ranger. Once the meal had finished, and a companionable silence had fallen over the camp, he sat on the ground, leaning back against one of the logs by the fire, long legs stretched out and a hand resting comfortably on his stomach. He grinned broadly, unthinkingly, and after the meal and the conversation, seemed content for the moment merely to sit and relax in the company that surrounded him. Brassica, having taken custody of the coneys once they’d been skinned, had persisted in this charge now that they’d been eaten. Humming softly to herself , she was picking over the carcasses and layering them in Torogethir’s dented kettle, along with a handful of vegetables she’d raided from the crates at the campside, to be topped over with water, and allowed to simmer slowly on the banked fire overnight, so Torogethir might have a nice stew the next day. Celebarad had returned once more to his book, and Beldrieth had seated herself nearby, occasionally answering questions Celebarad posed about some passage or the other, but otherwise methodically occupied with restringing her bow. Apparently this had slipped from Beldrieth’s mind as well, and, now reminded, she retrieved the folded and sealed piece of parchment, and handed it to the Ranger, leaning forward and stretching so he could reach and take it. Torogethir groaned slightly at the effort of sitting forward, and then chuckled ruefully as he grasped the parchment between the tips of his fingers, straightening to sit up properly, with a sigh, and holding the message up in the light, unopened. There was a wry twist to his lips, and he made no move to break the seal. Instead, he flipped the parchment nimbly between his fingers, and sighed. “Be nice,” Brassica growled, as menacingly as is possible for a hobbit (though this is considerable menace, when good manners are under siege). “In Westron,” Beldrieth corrected, gently. 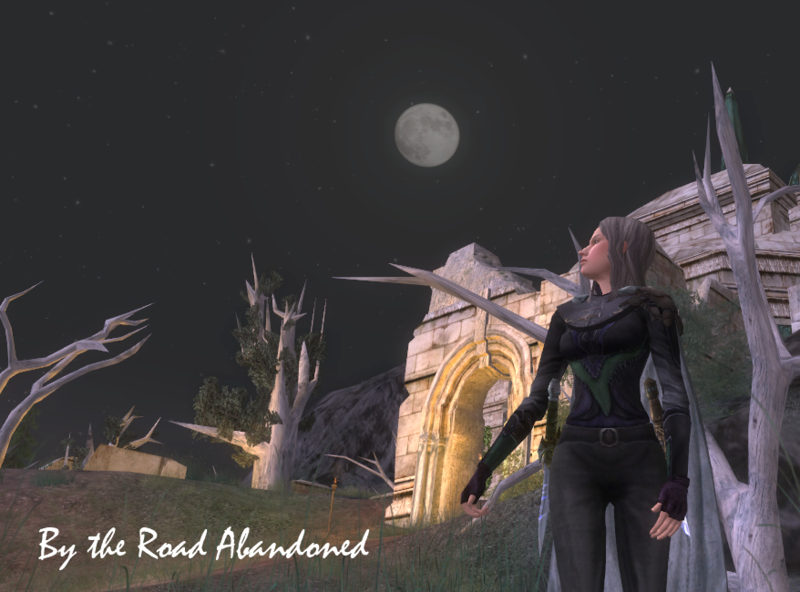 This seemed to Llythne to be a silly thing to worry about, but she recalled the tales that had kept her from this road in the past, and wondered if perhaps that was where Beldrieth drew her caution. In the warmth and the safety of the watchtower’s shadow, however, these seemed frivolous concern, and more pressing to Llythne was the fact that she was owed her winnings.